While there are many music converters in the market that are advertised to convert Apple Music on Mac, most of these audio converters can only convert non-DRM audios or DRM-ed audios, but TunesKit DRM Audio Converter covers both world, and can also complete the task of saving Apple Music in common MP3 audio files. TunesKit DRM Audio Coverter for Mac can help Apple iTunes users strip DRM protection off movies or TV shows rented/purchased from the Apple Store and to convert the M4V videos to DRM-free MP4 format on their Mac computers. It does these by simply removing the DRM from Apple Music to produce a clean and clear copy of the song as MP3, AAC or lossless FLAC, or WAV format, which can be transferred to any MP3 player or portable device of your choice. Convert all non-DRM and common Audio files to other format. All-in-one DRM audio tool to remove DRM copy protection from Apple Music, iTunes M4P and Audiobooks. 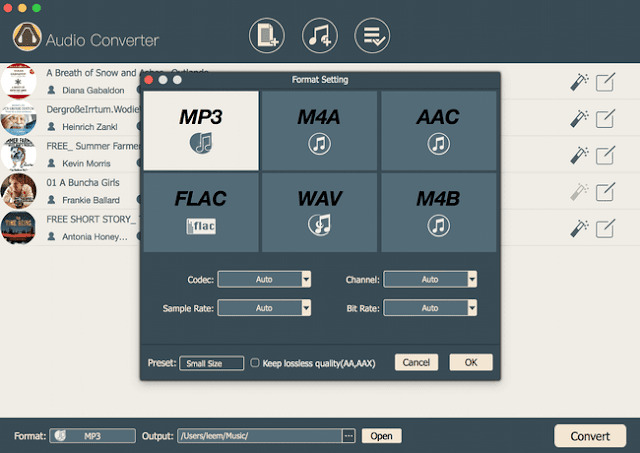 Convert DRM-ED Audios to MP3, AAC, WAV, M4V, M4B, and FLAC. Customize audio settings and split large audio into small segments. What is the Requirements and file formats supported? TunesKit DRM Audio Converter is fully compatible with Mac OS X 10.8, 10.9, 10.10, 10.11, and macOS 10.12 Sierra, and as at the time of this review, it's perfectly compatible with the most up-to-date iTunes 12.7. And TunesKit DRM Audio Converter runs the latest multiple-thread audio conversion technology, which makes it possible to convert the DRM-ed or non-DRM audio files at a 30X faster speed than normal converters, and still maintains a high quality for the output files. It is perhaps the most complete audio solution that convert all popular audio formats, including MP3, WAV, WMA, FLAC, AAC, OGG, M4A, M4R, AC3, AMR, APE, et al. And also, Apple Music M4P, iTunes tracks, M4A, M4B audiobooks, Audible AA, AAX to MP3, M4A, WAV, FLAC, M4B, AAC so that you can play the converted audio on any device or player. To convert audios to other formats with TunesKit DRM Audio Converter, including adding audios, adjusting output preferences, and converting the files can be done in these 3 easy steps : First, Open TunesKit Audio Converter, then directly drag the audio files (both DRM or non-DRM is supported), from your computer drive to TunesKit conversion window or alternatively, import the audio files via the "Add Files" button at the top center. Then set the output audio preferences, including output format, codec, bit rate, sample rate, etc. By simply clicking the ’Editing" icon or the "Format" option and you'll get to the setting window. And the last part, all that’s required now is press the "Convert" button at the bottom right corner and TunesKit will begin to convert the audios to MP3, M4A, WAV, FLAC, M4B, AAC for you at up to 30X faster speed. TunesKit DRM Audio Converter for Mac is indeed a superior audio converting software, as It offers all the best features for handling audio files such as removing DRM, converting audio formats, customize playback settings and so on. Also, it offers a FREE Trial which is great to help you try out the software and you'll finally find that this smart app is well worth your $40 bucks. No matter what you need to do with your audio files or what kinds of music you have, you can always let this smart tool to help you do it quickly and reliably.